Ready to travel with me to Holland? I attended the 5th annual Dutch Design Week in Eindhoven, Netherlands this past weekend and have so many highlights to share here on decor8, although a majority of my DDW posts will be over on another design blog, where I'm a guest for the week (I'll reveal where with a link as soon as the first batch of posts are up). Beyond DDW though, a very special highlight was meeting up with Danielle from The Hague. I met her here on decor8 when I posted about her urban oasis. Who would have thought a simple post would lead to meeting up in real time? After featuring her posh pad, we swapped design magazines and started emailing eachother. When she heard I'd be based in Germany for a few months, she offered to meet up with me somewhere in Europe (she is a total globe trotter). Excited about the idea, I quickly agreed and from there, we tried to decide upon a good meeting place. Would it be Berlin? Copenhagen? Then an assignment rolled in that would lead me to attend Dutch Design Week in Eindhoven, so we agreed that this would be the ideal location, since she not only lives a few hours away but also had planned to attend DDW too. It was such a pleasure to not only attend DDW for the first time, but to roam the many exhibition halls with Danielle since she's so passionate about design and being Dutch, she has a firm grip on the history and influence of design in her country. Her perspectives were all quite interesting to me. If I had attended with a fellow American, the experience wouldn't have been the same, so I'm privileged she was my companion. Seeing design through my American lens as well as from Danielle, who is largely influenced by her upbringing in the Netherlands and extensive travels throughout Europe and Australia, lead to a most refreshing and enlightening exchange. I'm so pleased that I shared this experience with a special new friend (thanks, danielle!). My husband, a German, remained rather quiet during the whole event while Danielle and I seemed to have an opinion on everything and felt no need to hold back on exchanging them. Tee was more reserved, he often kept his distance focusing more on photographing the event, so I wasn't sure what was going on inside his head. Of course, being married now for 5 years, I should have known that that is typical behavior for him when attending large-scale events. He quietly absorbs, shoots photos, and then, post-show, shares the most fascinating viewpoints - all extraordinarily deep - for hours. This conversation usually takes place between 24-48 hours afterwards, and so this morning over breakfast was when Tee was ready to discuss DDW. It was like attending the event all over again, he had so much to say, often on details I had overlooked myself. We went on to discuss the history of Dutch design, his perspectives on its future, along with thoughts on what good design really is. Another topic I found fascinating was when he shared with me his opinion on how so many young people are determined to replace and rebuild what their ancestors spent thousands of years perfecting, and how as time progresses, modern design is sailing quite far away from its traditional roots. The risk is that someday, after we're long gone from this planet, cultural roots may no longer be represented in design at all, since economy, the hope of becoming the next big thing, and the need to 'break the mold' so often influences designers today that we have to wonder where this will all lead in the next 20 years and beyond? 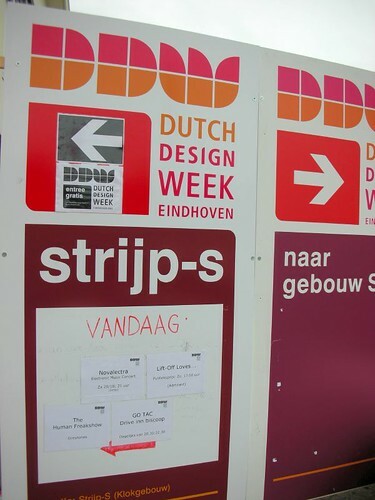 DDW not only brought me closer to the innovative world of Dutch design, but lead me to a new friendship with Danielle and a most fascinating discussion with my husband on some of my favorite topics. The perfect recipe for a time well spent. After Eindhoven, Danielle and I parted ways and then it was onto Venlo for a relaxing evening in a charming and historical city which dates back to Roman times. I have so much to share with you from Eindhoven, but with over 500 photos and mountains of notes and business cards to sort through, I need some time to organize everything. I also have a few project deadlines to meet, so we'll go Dutch starting tomorrow if that's okay with you. I'll be back in a moment with a few fresh finds, so don't go away!